Ready to learn about Solutions, Body Fluids, and Electrolytes? If so — good! You’re in the right place because that is what this study guide is all about. The practice questions found below correlate well with Egan’s Chapter 13, so you can use this information to help prepare for your exams. Are you ready to get started? Let’s dive in! If your Respiratory Therapy school is like mine, then you probably use the Egan’s Workbook. Most RT programs do. Don’t get me wrong, it’s a really good workbook that can be helpful at times. The problem is, it takes way too long to look up all the answers. 1. What is a stable mixture of two or more substances in a single phase, that cannot be separated by centrifuge? 2. What is a substance that dissolves? 3. What is a medium in which a substance is dissolved? 4. What is a colloid? A substance consisting of large molecules that attract and hold water. 5. What is an example of a colloid? The protoplasm inside of cells. 6. What is a suspension? They are composed of large particles that float in a liquid. 7. What is an example of a suspension? Red blood cells in plasma. 8. What does NaCl stand for? How much osmotic pressure is exerted by a solution. High tonicity greater than 0.9% NaCl. Low tonicity less than 0.9% NaCl. 12. What is it called when two solutions have the same or similar tonicity? Isotonic (equal to 0.9% NaCl). 13. How does a hypertonic solution affect the cells? It draws water out of the cells in order to reach equilibrium of pressures. 14. How does a hypotonic solution affect the cells? It adds water to the cells in order to reach equilibrium of pressures. 15. What is the force produced by solvent particles under certain conditions? 16. What does osmotic pressure do? It redistributes solvent molecules so that the same concentration exists on both sides of a semipermeable membrane. 17. What allows the passage of solutes but not solvents? 18. What are positive ions that migrate to the negative pole of an electrode in an electrolyte solution? 19. What are negative ions that migrate to the positive pole of an electrode in an electrolyte solution? 20. What is the common expression of the minute values for most chemicals in the body? mEq or milligram equivalent weights. 21. Dilute 10 ml of a 2% solution to a concentration of 0.5%? 22. What kind of compound can donate H+ or accept an electron pair in an aqueous solution? 23. What is the relationship between Hydrogen ions and protons? 24. What is a compound that yields hydroxyl (OH) ions when placed in an aqueous solution? 25. What is a substance that can inactivate an acid? 26. What is another name for a base compound that inactivates an acid? 27. What is it called when a base is paired with an acid that donates the proton? 28. What does the pH scale describe? The concentration of H+ in a solution. 29. Is pH represented as a positive or a negative number? 30. What is the pH of water? 31. What is the pH of the body? 32. What is the pH scale? A scale of pH ranging for 1-14 with 7 in the middle representing water, decrease in number becomes more acidic the more it moves to the left, increase in number means more alkaline the more it moves to the right. 33. What does a pH of 3 represent? 34. What does a pH of 12 represent? 35. What is the major component of the body? 36. What percentage of the body is water? 37. What effect does increased CO2 have on pH? 38. What effect does decreased CO2 have on pH? 39. What is the fluid between cells but outside of vascular spaces? 40. What does interstitial fluid do? It provides structural support during times of cellular volume depletion. 41. What are the predominant extracellular electrolytes? Sodium (Na+), chloride (Cl-), and bicarbonate (HCO3-). 42. What are the predominant intracellular electrolytes? Potassium (K+), magnesium (Mg++), phosphate (PO43-), and sulfate (SO42-). 43. What causes the high osmotic pressure of plasma? 44. What is an important determinant of fluid distribution between vascular and interstitial compartments? 45. Intravascular and interstitial fluids have similar what? 46. What are examples of insensible water loss? 47. What is the average daily volume loss of water from the lungs? 48. What is the average daily volume loss of water from the skin? 49. What are examples of sensible water loss? 50. What causes an almost immediate shift of the body to alkalinity? Washing out of the stomachs acid; vomiting. 51. What causes an almost immediate shift of the body to acidity? Washing out the GI tracts bases; diarrhea. 52. Does ventilation have an effect on water loss? 53. What are ways to replenish water? 54. How does most water get replaced? Ingestion from liquid and solid food. 55. How does metabolism replace water? Oxidation of fats, carbohydrates, and proteins; also the destruction of cells. 56. What is the average amount of liquid consumed each day by an adult? 57. What is the pressure caused by the weight of a fluid called? 58. Hydrostatic pressure can also be defined as? The volume of fluid in a container and the effects of gravity. 59. What is the importance of hydrostatic pressure? It enhances the movement of fluid and solutes between capillary blood to interstitial fluid. 60. What causes an increase in hydrostatic pressure? Back-pressure from failing left ventricle; congestive heart failure. 61. How does an increase in hydrostatic pressure effect the pulmonary circuit? It disrupts the balance, causing fluid to move into the alveolar-capillary spaces; pulmonary edema. 62. What is the normal value of sodium (Na+)? value range? 63. What is the normal value for chloride (Cl-)? value range? 64. What is the normal value of potassium (K+)? value range? 65. What is the normal value for bicarbonate (HCO3-)? value range? 66. What is a low level of sodium called? 69. What is a high level of chloride called? 71. What is a high level of potassium called? 72. What is the ratio of bicarbonate (HCO3-) to carbonic acid in a healthy individual? 73. Bicarbonate (HCO3-) is the primary means of transporting what? CO2 from the tissues to the lungs. 74. Hyperkalemia is a common result of what? Renal insufficiency restriction of potassium (K+) intake. 75. What regulates HCO3- levels to maintain a near normal pH in an acid-base disorder? 76. What do the kidneys do in respiratory acidosis? Retain or produce HCO3- to buffer against the additional acid caused by CO2 retention. Reabsorption is the active or passive transport of filtrate substances back into the tubule cell and then into the blood of nearby capillaries. 78. What is the law of electroneutrality? It states that the total number of positive charges must equal the total number of negative charges in the body fluids. 79. What occurs when any physiological process lowers PaCO2 less than 35 mmHg and raises pH more than 7.45? 80. What occurs when any physiological process raises PaCO2 more than 45mmHg and lowers pH less than 7.35? 81. What type of breathing pattern is exhibited by patients with severe diabetic ketoacidosis? 82. What are three renal causes of metabolic alkalosis? 83. What are 3 causes of respiratory acidosis in normal lungs? Anesthesia, Sedative drugs, Narcotic analgesia. 84. How can hyperventilation and respiratory alkalosis be induced? The hyperventilation can be caused by overly aggressive mechanical ventilation as well as deep breathing and lung expansion procedures. 85. What is partly compensated respiratory alkalosis? Low PaCO2, low HCO3-, and alkalotic pH not in the normal range. 86. What is fully compensated respiratory acidosis? High PaCO2, high HCO3-, pH on the acidic side of normal pH. 87. What is the blood buffer base? The blood buffer base is the sum of bicarbonate and non-bicarbonate bases in the mmol/L of blood. 88. What is the difference between an open buffer system and a closed buffer system? In an open buffer system, some of the solutes are removed from the body, while in a closed system, they are kept and used within the system of reactions. 89. What are the differences between excretion and secretion? Excretion is the elimination of substances from the body in the urine. Secretion is the process by which renal tubule cells actively transport substances into the filtrate. 90. What are the two primary acid-excreting organs? 91. How does the Henderson-Hasselbach equation determine [H+]? The H-H equation determines hydrogen ion concentration by computing the ratio between undisassociated acid molecules [H2CO3] and base ions [HCO3-]. 92. What are the normal arterial PCO2 and arterial bicarbonate concentration values? 93. How is base excess determined? It is determined by equilibrating a blood sample in the laboratory to a PCO2 of 40 mmHg at standard body temperature Celsius and recording the amount of acid or base needed to titrate 1L of blood to a pH of 7.40. 94. What is a combined acid-base disturbance? A disturbance where they are both respiratory and metabolically related. 95. What corrective measures are used in correcting hypokalemia? Potassium chloride (KCl), dilute hydrochloric acid (HCl), or ammonium chloride (NH3Cl) may be infused directly into a large central vein. 96. What is an Antidiuretic hormone (ADH)? Also known as vasopressin, it is the hormone that regulates water secretion. 97. What is the most prominent anion in the body? 98. What is the major circulating cation within the body? 99. Acid-base balance depends on what? The concentration and activity of electrolytic solutes in the body. 100. Ammonia and carbonates are examples of what? 101. What is a base? A compound that yields hydroxyl ions (OH−) when placed into aqueous solution. A substance capable of inactivating acids is also considered a base. It is any compound that accepts a proton; bases are paired with acids that donate the proton, and these are called conjugate pairs. This definition includes substances other than hydroxides, such as ammonia, carbonates, and certain proteins. 101. Dilute solutions are made from what? They are made from a stock preparation. Preparation of medications often involves dilution. Dilution calculations are based on the weight-per-unit volume principle (the aforementioned W/V solution method). 102. Solutions with similar tonicity are called what? He was a nineteenth-century British physiologist who studied fluid transport across membranes. His hypothesis states that the fluid movement secondary to filtration across the wall of a capillary depends on both the hydrostatic and the oncotic pressure gradients across the capillary. The driving force for fluid filtration across the wall of the capillary is determined by four separate pressures: hydraulic (hydrostatic) and colloid osmotic pressure both within the vessel and in the tissue space. 104. The term acid refers to what? Either compounds that can donate [H+], or any compound that accepts an electron pair. 105. The term concentration refers to what? The amount of solute dissolved into the solvent. Concentration can be described either qualitatively or quantitatively. 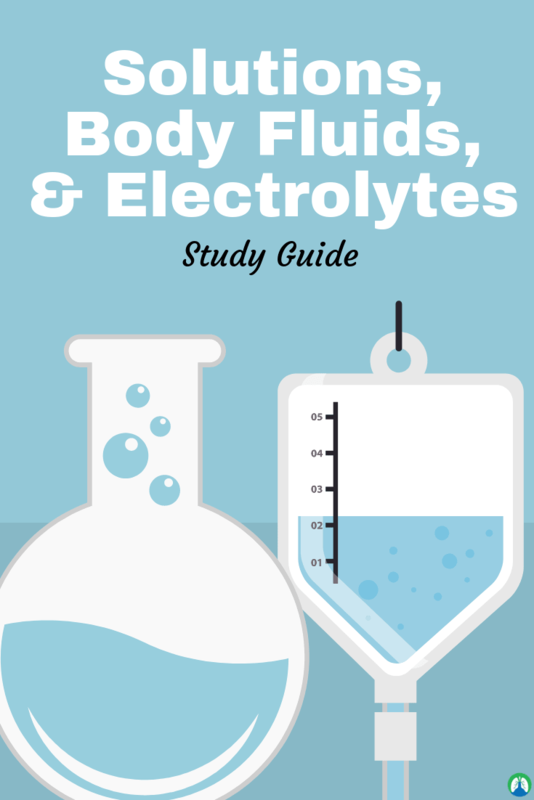 And that wraps up our study guide on Solutions, Body Fluids, and Electrolytes. Thank you so much for reading all the way to the end. Your hard work and dedication is going to pay off in a big way for you in regards to your exams scores. Just be sure to go through the practice questions until the information sticks. Thanks again for reading and as always, breathe easy my friend.